What mood does this tree convey to you? Does this tree help you recall a special memory? What saying does this tree remind you of? Do you ever dream about trees, or a particular tree? Why do you think the artist drew this? Take a guess! I suppose you could hook a tire to the tree maybe on one of the branches higher up. I’m glad this drawing evoked pleasant memories, Jill. I agree – but Cliff drew it as an album cover for a musical group called “Leaf.” My guess is that the group played alternative music as the design looks whimsical, and as you say, like in a fairy tale. I love your take on the tree, Anita. And maybe that one person will be a guest at the Thanksgiving table next week. Yes, “there is always that one person . . . ” Ha! Remember the mean, talking apple trees in the Wizard of Oz? It was a while before I’d climb a tree after watching that movie! Now that you mention it . . . . That image is ironic because we usually associate apple trees with something pleasant but those were eerie, Hallowe-en-ish. Your memory of this tree shows the immense power of pictures on impressionable minds. Thanks, Lynn. It takes me back to a November day playing on a tree swing from an old elm on our farm and I was thinking and wondering about my life ahead and whether at the age of 15 I had lived half of my life, or just 1/4 or 1/8th…. ! My grandfather had lived to be 90 and had died a few years earlier and we were very close, since he lived in doughty (?) quarters in our home. You have such precise recall, Melodie, maybe because you have used the “writerly” part of your brain so intensely over the years. I don’t remember having such philosophical thoughts at 15 and associating them with a particular setting. The dodie (sp?) house (grandparents’ quarters) was a wonderful accommodation for the older generation who didn’t need to be uprooted and taken to an institution when they could no longer do for themselves. Thanks for this nugget, Melodie. My recall on that was so great because I once wrote a poem along those lines; I think I might have it somewhere. When many have dropped out of your life or fallen away due to natural attrition, there is always one who hangs on to give life color, meaning and much needed encouragement and friendship. Ah, very sweet. I find that sentiment to be true in my own experience. You have extracted something very poignant from this metaphor. Thank you, Carolyn! A half century ago I took a summer school class in creative writing; it was my first time doing something so focused. That summer launched my intensive journaling and poetry life. One of the first assignments our teacher gave the class was to write on “What is the opposite of a tree?” My response was “the color red”, the brashness of the color in juxtaposition of the grounded and solid tree, etc. Wonder whatever happened to that particular essay…. Oh, Ginger, what a fascinating assignment and your reply to it: offering a color as opposed to another identifiable image. Much of my blog inspiration comes from images, photos or drawings. Thanks for sharing your writing teacher’s prompt and your response. I’m glad you found the drawing evocative. Marian — The tree reminds me of reading Evan one of the Bernstein Bears books titled, “The Spooky Old Tree.” He adored that book. Thank you for bringing those fond memories to the surface. I remember reading Berenstain Bears to my own children. I don’t recall reading them about a spooky old tree, but I do recall the colorful illustrations in his other books. His bears looked mighty beefy. Thanks for chiming in, Laurie. I like that the roots are showing, and are as wide as the branches. And that in spite of only one leaf, there are still tufts of grass. I like also how it bows (boughs) down showing to me that it did and will again provide shade for the traveller who can rest his weary back against the trunk. This is a bit like a Rorschach test … 🙂 but pertains well to my weary mood this day. I am looking forward to an early night – a couple of hours to go still, but no late night like last night and I won’t have to think about why the artist Cliff drew it because you told us! Thanks Marian, it’s an evocative and graphic drawing. What a superb analysis, Susan. After the drain of your recent travels, you are in great form again. Your comment reminded me that the tree in autumn could be viewed as well upside down. The solitary leaf would have to be sacrificed in such a scenario though. I’m glad you enjoyed this flight of fancy. A warm thought on a cool day. I’m a Pooh enthusiast too. Thanks, Arlene! Desolate. Yes, that’s how the tree looks, lacking full foliage. However, I imagine you are enjoying warmer temps in your travels. RIght? The last time I checked Facebook, you were enjoying sunshine in southern France. Yes, we are enjoying the sun, but mornings are frosty. 0C outside this morning! Nice in the afternoon, though. This tree reminds me of how I usually feel in November. I also realize that I am in that season of my life where I might soon become like that tree. There is a haunted, ghostly look about it. The tree is on stony ground and appears to be almost dead. However, its roots are deep and strongly anchored, and it will survive the harsh winter to become strong and beautiful again in spring. It is in its resting phase right now. To me, the loveliest line in your reflection: “It is in its resting phase right now.” At the moment I feel like resting. Maybe a nap is in order. Thanks for sharing your perspective, Elfrieda. It reminds me of a lone tree sitting on a field in the prairies near a deserted old house. Trees always look so sad when they lose their leaves. Many stories could be written about that tree! Trees are rooted in your family history — and in your lovely “Amanda” books. Thanks, Darlene. Age, wisdom, death; the sadness of the ultimate part of life, which is loss. That is what this tree makes me think of. Your thoughts match some of the other commenters, Lucinda. There is good news – if we age well, wisdom is its fruit. I must admit, as the seasons change, I’m feeling a sad prick at the loss of my mother and aunt, both in the last few years. And best wishes as you re-charge at your brothers’ meating place! The way you worded your good wishes made me laugh. 🙂 Thank you! I’m glad you have a punny bone too, Luci! I never dream about trees, but what this image conjures up is the funky twists and turns in our brains and how it is difficult to make decisions and follow a certain path. We come across so many splits in the road and need to choose which way to go. Just like in the branches of this tree. Yes, the gnarly tree is a good metaphor for the unpredictable twists and turns that register in the decision-making part of our minds. Thanks for the insight, Liesbet. That wonderful illustration reminds me of Winnie The Poo in hundred acre wood . I love Winnie the poo and I love trees . If ever I have a deep rooted problem ( ha ha sorry about the pun) I either pick up my complete book of Winnie The Poo ,that my son bought me , or walk in the woods ( winter) sit under a tree and watch the world go by ( summer) . A world without Winnie and trees 🌲 is unthinkable. A person could come up with various scenarios upon looking at this tree. First one comes to mind is a feeling of loneliness due to it being without leaves – save for the one lonely leaf, but then another aspect is the fact that the tree is still standing and looks mighty indicating it can weather whatever is thrown at it and still survive. First thought or mood that crossed my mind was one of solitude and yet I can envision sitting under the tree just taking in the landscape and marveling at the wonders that our Earth provides us. I can also picture someone sitting under the tree with pad and pencil capturing their thoughts to share with others. There is a saying by Steven Berkoff that goes: “Writing is an antidote for loneliness.” Being a former city boy – I don’t think too much about trees but if one particular tree comes to mind after seeing this picture, it would be of The Kapok Tree which was a famous tree on the grounds of the Kapok Tree Restaurant in Clearwater, FL Another such tree that is magnificent and awesome is The Banyan Tree. As to the mood the artist might have been in – hard to say – could have been loneliness and then it also could be one of strength thinking how some mighty trees have weathered the test of time. Didn’t mean to ramble on but wanted to share the thoughts that galloped through my mind upon seeing this drawing. Whether you are rambling or galloping, Irwin, your thoughts are welcome. Thank you too for the quote from Steven Berkoff, “Writing is an antidote for loneliness.” It is also a place to vent many other emotions including grief. You mentioned a banyon tree . . . the first time I saw one was in Miami. I was dumbstruck. It looked magical and otherworldly, like something seen on a movie set. And I definitely agree about the idea of this tree communicating strength because it has endured the test of time. Thanks always for your contribution here. 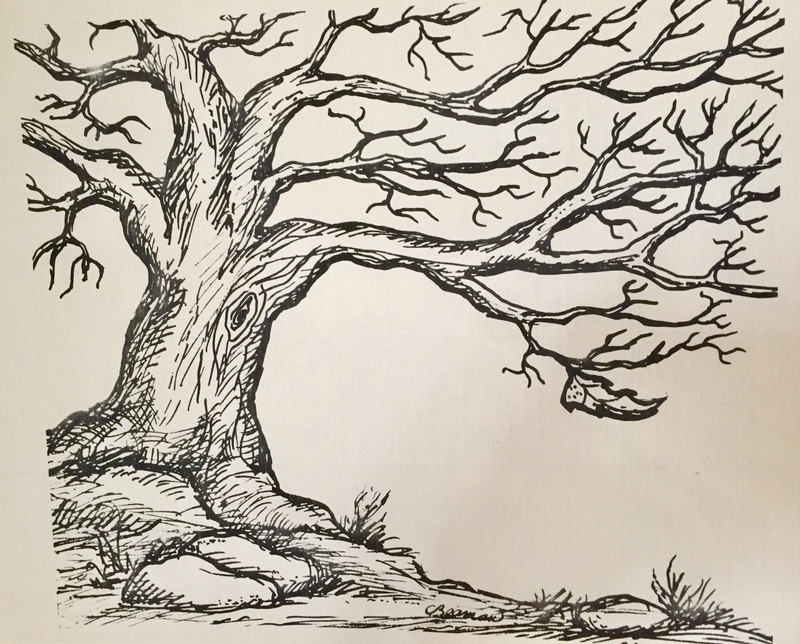 For all your readers–I was probably feeling positive when I drew this tree, since I was being paid by the music company that planned to use this to advertise their band. While drawing it I did envision a lonely tree that still had a hopeful future, with one leaf hanging in there. That said, however, I just love to draw trees. Perhaps sometime I’ll share two or three others with your Plain and Fancy audience, Marian. If you are going to share two or three others in this space, I assume that means you plan to go through more files and find a new home for these discoveries – ha! Thanks for the detail here. Long ago, when you drew this tree I must have been busy with teaching and family duties. I don’t remember seeing it until a few weeks ago . . . seriously. This tree speaks to me of the cusp between autumn and winter; of squirrels and birds; of the tenacity of the leaf. Your reply here sounds like pure poetry. I know you love nature and wild-life. Your blog pays homage to their beauties every time you post. Thank you! It makes me sad, clinging to its last thread of summer – memories of children’s laughter and lovers stealing kisses under the moon. So thankful I know this it is all part of renewing life. You’re words are true, yet it’s hard to latch onto the thought of rebirth when the last leaf falls off the tree. Thanks for delightful images of summer. I wonder what these trees would say as they witness our human folly! Humankind has history and kinship with trees, the cathartic phenomenon of the ‘screaming tree’, and wood in our first technologic interactions. Nice post! Thank you, cargo collective photographer aka son Joel. I inspected the trees when you sent them on FB messenger. They are even more amazing the second time around. I daresay Beth Moon didn’t use an iPhone. I really, really like the one tagged “rooted passage,” maybe because it looks homey. Cliff’s beautiful drawing takes me a few places. You know I love trees all year round. In winter, I love the way I can see the branches and squirrel and bird nests in the canopy. I love how the trees strip down to their bones. By this time of year nearly all the trees are leafless unless they’re evergreens. A few old oaks hang on to russet leaves, but not for long. I’m locked out of my forest and can’t lean into the big trees as I often do since it’s the first weekend of hunting season. By next week when the hunters on National Forest land bordering my property return home and only a few hunters remain, I’ll be out there wrapped in orange. Orange stands out in the somber tones of autumn. Along with Susan, I’m drawn to the deep thick roots clinging to the rocks and the dipping branches. A venerable shade tree deserves a long winter’s nap. You live in a sanctuary of lovely trees and express that love so poetically. May the only shots that penetrate your orange wrap be welcome arrows of blessing and peace. Thank you for the lyrics to the song reminding of life’s ebb and flow ~ and yes, all without regret.